The second (Al-Aqsa) intifada that erupted across Israel in 2000 eventually led the Israeli Defense Forces to deploy armored tracked vehicles (ATVs) (tanks, armored personal carriers, and D-9 bulldozers) within Israel’s agricultural periphery of the Gaza Strip to counter daily attempts of guerilla and terrorist squads to infiltrate Israel. During operations in the winter rainy season, it was reported that ATVs often sank in muddy terrain. This study investigated what caused ATVs to sink and stall in order to develop and suggest preventive measures. The principal environmental data collected included land-use characteristics, soil association and type and daily rainfall. Reconnaissance surveys and field soil cone penetrometer tests were conducted at sites having different characteristics. Interviews with commanders were conducted to obtain details on the ATV sink events. The soils, especially in agricultural fields, were generally found to be favorable for ATV traffic, even shortly after rainstorms of 10–30 mm. However, following several rainfall events in excess of 10 mm, ATVs and tanks regularly sank in local topographic depressions in short segments of dirt roads where runoff and suspended sediment collected. ATV traffic cut ruts in the mud and compacted soils. 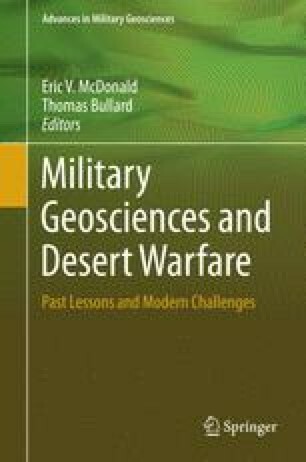 These changes to topography and soil characteristics altered drainage patterns by directing significant surface flow and suspended sediment into the depressions and effectively creating “tank-sinks” where trafficability ranged from “untrafficable” to “trafficable with constraints.” This study shows that intense, routine, defensive military activity operated without adequate terrain and/or environmental analysis and monitoring can produce repetitive, self-inflicted, environmental and combat problems. Ofir Krup is warmly thanked for carrying out tedious measurements in the field. Arie Zamler is warmly thanked for pushing this project through, and for field work and data analysis. Ofer Sholker and Eli Argaman are complemented for providing field assistance and data. Rami Haruvi is thanked for his excellent field advice. The Israel Meteorological Service is thanked for daily faxes of precipitation data. I acknowledge ICMG organizers for providing assistance to attend the 9th ICMG in Las Vegas in 2011.